Storm clouds have been blocking out the stars more than usual in Delaware. But thanks to meteorologist and jewelry artist, Jennifer of WXdruid Chainmail, I now have a star that is visible on even the foggiest of nights. Instead of making a necklace out of the celtic charm she sent, I added it to a key ring as a zipper pull on my purse so I can see it shine every time I go out. The green and purple jump ring combination is smashing - it reminds me of the Hulk. He might even think twice before trying to destroy this design. The star flower may only measure an inch across, but it packs quite a punch. Disclaimer: I received this free pendant as a thank you gift for hosting a jewelry giveaway. If you think your handmade creations would harmonize with my whimsical ramblings, learn how to sponsor a giveaway here. 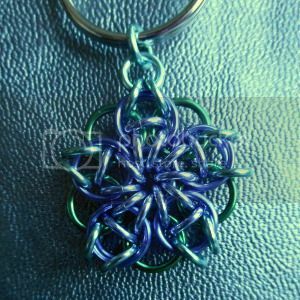 Very cute celtic flower/star charm!